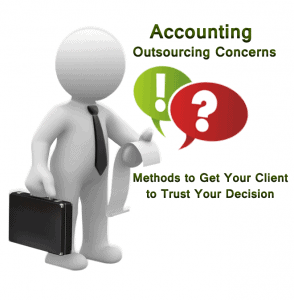 Do Your Clients Have Accounting Outsourcing Concerns? Your clients’ trust is at the heart of building a successful firm. There’s a direct dollar correlation – the more your clients trust you, the more work they’re going to send your way. So now you have their trust and the work that comes with it and you want to expand your ability to handle the workload via accounting outsourcing. What do you do when your clients bulk at you sending their files overseas? The more you can show you know your clients’ affairs inside and out, the more that you can demonstrate you have a handle on whether or not accounting outsourcing would be a danger to their particular file. Structure is soothing. If you’re the one setting the structure of emails, phone calls, and most importantly, meetings, then you’ll be sure to get across all the points you want to make. If you let a worried client set the agenda then their fears may lead to a scattershot approach and they won’t take in your information as well as they would in a clearly defined correspondence. Nobody likes to have their concerns waved off or labelled as unimportant. What seems like a non-issue to you, the seasoned accounting pro, might be something that is keeping your client awake at nights. Want an easy way to show that you’re reliable? Make even the little things a promise. That way when you deliver an information brochure you get to write, “As promised” in the note and voila! you’re the firm that always keeps its word. Clients with accounting outsourcing worries are going to have a much easier time trusting Bob or Jane than they are an unfeeling firm. When you write an email, make sure your name is on it as opposed to it just being from the firm. Same goes for letters, blog articles, ebooks, letters to the local newspaper, etc. Nothing says that you’re trustworthy more than a strong, loophole-free guarantee. Go as far as saying that if your client isn’t satisfied then they don’t have to pay, or that you’ll cover their cost this time round during the tax-return season. It’s a simple psychological method to get people to like you more – start off with a compliment. Tell a client who has accounting outsourcing concerns that you admire the way their business handles something, or that you wish more clients would prepare their tax return information as cleanly as the particular client. Did you solve a particularly nasty pain point for another client? Did you save someone a lot of money? Point out and rectify a potential pitfall in a small business’ books? Write it up and either send it out via a newsletter or stick it in a case study section on your website. Get a glowing recommendation from the case-study’s subject. There are potential clients out there who are worried about your firm’s accounting outsourcing, but once they see how you came through for another client who was facing the same financial problems that they currently face that potential client is much more likely to choose you over your competition. This isn’t about using naughty words (although you should probably avoid that too). This is about getting too esoteric with your accounting-talk. Clients’ concerns about accounting outsourcing are only going to grow if you leave them confused about what it is you’re saying. Make your talks as understandable as possible for the uninitiated. Don’t be afraid to hit the major points one more time at the end of a meeting. Do a quick point-form summary of your head-to-head just to make sure that your client has proper definitions and answers to all of their questions. Trust will suffer if they go away from the meeting, encounter a nasty surprise, and then come back to you with, “I thought you said X” when you were actually trying to say “Y”. The answer is absolutely yes. In fact we have a whole page dedicated to laying out our security features and procedures. If you have any questions at all about how we can help you soothe your worried clients then please don’t hesitate to get in touch with us via our contact page.